​Crochet refers to the use of yarn which is creatively made up into an actual textured fabric using a hooked needle with a blunt edge called a crochet hook. Crochet is often mistaken by armatures for a knitting technique. While both use yarn, the technique is different. As a beginner, the main distinction you will be able to make is that knitting has rows of stitches being worked on at the same time while crocheting has got one stitch being worked on at a time. Knitting involves working several ‘live’ stitches in a row using knitting needles while crocheting involves working one ‘live’ stitch at a time using a single crocheting needle. With that out of the way let’s focus on crocheting. The basic technique involves creating fabric using a yarn which is creatively interlocked using different patterns. Before you learn the patterns let’s look at the terminology, you will come across throughout your crocheting venture. If you look at the top of the stitches, you are making even using the simplest of stitches like the chain stitch you will see the resemblance of a road with a pavement on either side. How will you read and understand the different patterns? The best way is to get an illustrated guide that used images or video to illustrate the different patterns. There are various such guides on the internet. You can also buy such instructions from the local bookshop. The best way, however, is to get a personal tutor who is conversant with the different patterns and stitches and can effectively communicate the same. After or as you learn the terminologies it is essential to no familiarize yourself with the different stitches as it is these that make up the different patterns, some of which we are going to explore. Slip a knot over the crochet needle. Secure the knot reasonably. This is called the slip knot. Hold the yarn just below the knot between your thumb and index finger of your left hand. Hold the yarn towards you making the knot face you. 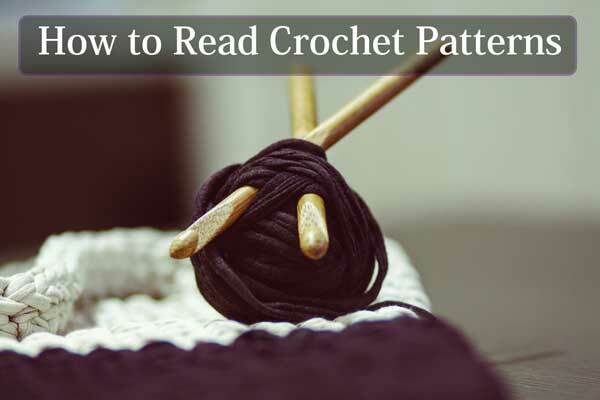 The crochet needle will initially face up as you tie the slip knot, but as you start crocheting, you will naturally slightly turn it towards you with every knot you make; it is a motion that will come to you, and you will learn to make quick, smooth motions with time. The yarn by now should be flowing past your thumb and index finger past the rest to the ball; you will find your left-hand fingers will coordinate to ‘feed’ your thumb and index fingers which in turn ‘feed’ the yarn to the crochet needle to make the stitches. Keep the slip knot on and now with your right hand slip the crochet needle between the yarn and index finger on your left hand. Pull it through the slip knot by hooking it with the crochet needle and turning it clockwise at an angle. You will feel comfortable pulling it through the slip knot to form your first chain stitch. Reposition the needle facing up; it is more comfortable and easier hooking the yarn with the needle facing up and easier to pull the yarn to form a knot with the needle slightly twisted. Note that everyone develops their own unique way of pulling the stitches after the initial induction. After mastering the chain stitch, you can now learn the other kinds of stitches which are essential to make some of the crochet patterns. Note that particular patterns are only suitable to make certain items for example table mats. It is this variety of stitches combined in a particular order and sequence that form the different patterns. The directions will include how many of one type of stitch to make before switching to another which will also have the same directions. It will also indicate what size of crochet needle you will require to give the required gauge for the particular item you are making. Different items have different gauges recommended although any gauge could generally make anything; it just might look misplaced or weird. ch 1, dc in next 10sts; start with a chain stitch and switch to double crochet in 10 steps. An easy way to master the flow of certain patterns is to sample your own. Make your own random patterns, see what they turn out like then you will be able to understand better how to follow other’s patterns. Note that any pattern you come across was made by someone just messing around like you are. You will be surprised that you actually might come up with a pattern of your own! The illustration above is a very short sample of the infinite possibility of pattern formations. It is actually part of a pattern. There is a more complicated combination of terms used to make more complicated designs. Such directions give more than just one action to be taken at a time. Is the pattern within your general scope of experience? How confident are you with the technique? How complicated is it? How often will you have to refer back to the pattern? Anyone given enough time can hack any pattern though it will be easy to tell a professional’s work from that of an armature by noticing certain inconsistencies. Take on a pattern you can confidently handle. Patterns are generally classified into beginner, intermediate and professional. For a beginner especially, it is advisable to start with patterns within that classification and then progressively advance to more sophisticated patterns. Learn the basics like the terms and start with simple stitches. A person with real interest will learn the art in no time. Crochet patterns are not rocket science and can be mastered by anyone.